The song’s 100-year history includes dismemberment, deceit and a legal battle over domain: doo doo doo doo doo doo. The first time Johnny Only heard the song Baby Shark was more than 20 years ago. Only, a children's entertainer based in Upstate New York, was a DJ at a kids camp, and the counselors would regularly perform the song with their campers, acting out the hand gestures and going through each verse. Only saw how engaged and animated the campers were when Baby Shark was performed, so when he became a full-time children's entertainer, he released his own version. That was in 2011, five years before another version of Baby Shark became a global phenomenon. If you're a parent with a child under, say, five or six, you know this song. It's the same song that plays in your head on an endless rotation and wakes you up from an already light sleep. Over an upbeat, K Pop-style beat, we meet a family of sharks, beginning with, of course, "Baby shark, doo doo doo doo doo doo." So simple and catchy in its premise, once it gets into your head, it never leaves. Even if you're not a parent, there's still a good chance you are one of the more than two billion people on the planet who have seen the video, or among the countless millions who have watched someone do the #Babysharkchallenge. In just a few short years, Baby Shark has become one of the 30 most watched YouTube videos in the platform's history. The song, released in 2016 by Korean children's entertainment brand Pinkfong, which is owned by the Seoul-based company SmartStudy, has been performed by the most popular K-Pop acts; featured by Ellen Degeneres; covered by Josh Groban, Sophie Turner and James Corden on The Late Late Show; and mentioned on social media by the likes of Cardi B and Kendall Jenner. In January, it cracked the Billboard Top 40, making it a traditionally certifiable hit. This past summer, it also hit the U.K. singles chart, where it peaked at number six. Johnny Only, whose original version of Baby Shark has amassed more than 100,000 views on YouTube, watched this all unfold with a bit of disbelief. "Didn't this sound just like his version of Baby Shark?" he thought. "Their version does seem strikingly similar to mine," he says. "Same key, same tempo change, same melody and rhythm." Technically no one owns the song because it's classified as a traditional, he adds, or so he initially thought. Like all traditional songs, Baby Shark has been passed down orally through generations, surviving in the camp communities all around the world, and dates back to at least the 1900s. Now the hit song is before the Korean courts in a copyright battle between Only and SmartStudy/Pinkfong in order to determine who, if anyone, own the rights to the current version of Baby Shark. SmartStudy, for its part, insists that they have full ownership of the song. "Produced by SmartStudy, we are the producer and publisher, we own and control 100 percent of the song," writes Seunghyun Kevin Yoon, marketing manager for SmartStudy, in an email exchange. The case is still with the courts and, according to Only, has been delayed twice. Only always assumed that Baby Shark, being a traditional song, was in the public domain, so open to anybody to use — that is, until the Liberty Korea Party, a right-wing party in South Korea, wanted to use Baby Shark to promote its candidates' campaigns in 2018, when they contacted Only and asked for permission to use it. "I didn't think I had any choice but to answer that it was public domain and they could go right ahead and use it," Only says. After Liberty Korea released its version, SmartStudy threatened legal action over copyright infringement, to which their reply was: Baby Shark is a folk song, and they had permission from Johnny Only, who owned the copyright to the version he released in 2011. "Suddenly I am on the South Korean news and I start getting comments in Korean on my YouTube video," says Only. 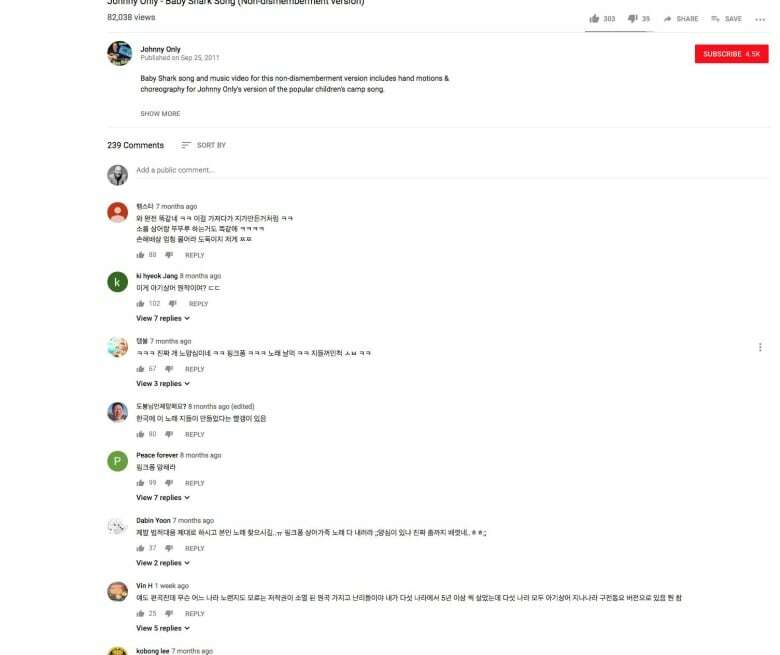 "Please do not forget to take legal action," one commenter wrote last summer in roughly translated Korean, while another wrote in English, "As I am a Korean, I am disgraceful to this case. Last, I am sorry." Only says that it was only then that he realized he had some rights. "The wheels in my head start turning, if Pinkfong's song is so close to mine that they can't even tell the difference, and Pinkfong tries to claim copyright infringement against their version when the political party is using my version, doesn't that mean that my version also has copyright protection?" The musician contacted a Korean copyright lawyer last year, and "now we are simply asking the Korean courts to give us a ruling on what they think regarding the issue between Pinkfong and my version." It's actually very common, particularly in the children's music genre, for traditional songs to be released and performed by various artists, with each one putting their own stamp on it. "One of the characteristics of folk music is that is ultimately adaptable," says Bram Morrison, of Sharon and Bram, the popular Canadian group. "[Baby Shark] is a classic example of a zipper song — that is, a song that is repetitive, and allows singers to insert their own thoughts into the verses, and always coming back to the repeated chorus. Sharon, Lois & Bram have done exactly this on many occasions. It's interesting that this one, which is pretty good, should catch the attention and go to where it is." Morrison provides the example Peanut Butter, a song that was "taught to me by a fifth grade class years before even Sharon, Lois and Bram, and I brought it to the group and we put it out and it's one of the favourites." He says that as artists release their own versions of traditional songs, in cases where they change the arrangement significantly, they can claim a copyright — not on the authorship of the song, but on the arrangement. "Skinnamarink, that's a camp song as far as I know," he adds. "We made an arrangement for it and it's kind of a unique and elaborate arrangement that is ours, so when we put it on a recording, when it comes time to pay royalties, we would get the recognition financially for the arrangement, which is calculated at 50 percent." Only says that "[Baby Shark] is as old as fairy tales. It is as old as the as the spoken tradition. And that's how it was passed from camper to camper, from camp to camp, from country to country. That's why we have a German version. That's why the German version was significantly the same as the American. Any country that has camps would have these formulas for how to engage kids, and certain themes would start to emerge that might be used year after year." 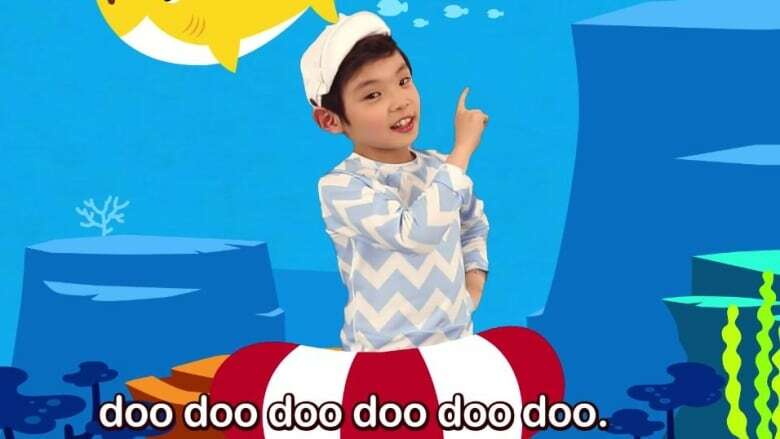 And this is where Only has a point of contention with the Pinkfong version of Baby Shark: he claims he is the one who turned it from that oral tradition, passed down through camps, where campers are encouraged to improvise lyrics and dance moves, into the song it is today. As Only heard it some 20 years ago, Baby Shark was all about the shark attack itself, and it was common for the song to lay out, in gory detail, the effects of such an attack. "There was none of this, I'm happy pastoral scene that we see now," he says. "If the shark attacked and got their arm, lost an arm, doo doo doo, and they hold their arm behind their back. Lost a leg, now they're hopping around on one leg. Lost a head, blood streaming, screaming for help, or then, you know, a heart attack or maybe they're trying to revive him with CPR or something like that. Different hand motions each time and you just keep going as far as the imagination can take you." When Only became a performer for toddlers, he remembered how engaged the campers were with Baby Shark, but he needed to create a more sanitized version, as "the lyrics were completely inappropriate," he says. Only removed the shark attack and the focus became the family unit. "I patterned it off of a famous children's toddler artist, Raffi," he says. "If you listen to Raffi material, there is absolutely nothing that would offend any grownup or any parent of a child. It's just so pastorally clean, and as far as I could tell on the internet, I was the first one that did that, you know? And basically Pinkfong's version does the same thing." Yoon, SmartStudy's marketing manager, writes that "we took a fresh twist and recreated on a traditional singalong chant by adding upbeat rhythms and fresh melody. We have a team of content creators based in South Korea that plans and directs the design, choreography, storyboarding and localization of Pinkfong's content." The company currently has over 100 versions of Baby Shark, which includes translations in 11 languages. They also put on a Baby Shark live show around the world and have plans to make a Baby Shark movie, as well as a line of toys in partnership with brands like Hasbro and Spin Master, the Canadian company behind the hit show Paw Patrol. ​While Only waits for a trial date, he is dismayed that his efforts have more or less been written out of the Baby Shark history. "There's the viral video on Facebook where the little girl is asking for Baby Shark on Alexa. Have you seen that one?" he asks. "Alexa can't understand her because she is a toddler, and so Alexa is trying to play the correct version of Baby Shark. Interestingly enough, Alexa starts playing my version of Baby Shark but then the parent intervenes and it gets Alexa to play the Pinkfong version. … I have had that forwarded to me at least 30 times." Only says he's not sure where a lawsuit will lead, but adds, "I think every artist wants to be recognized for what they've done. "If you look up Baby Shark on Wikipedia, my name used to be on there as someone who had recorded it, and now my name is not on the Baby Shark song page, you know?" he says. "And I do feel that with regard to making the camp chat into a toddler friendly song, I really feel like I did have a big part of that. I think it could be argued that I was the first one that did it." Listen to the full segment with Johnny Only near the top of this page.